There is a new children’s toothbrush on the market which uses . 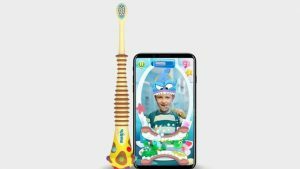 French company Kolibree announced at CES 2018 a smart toothbrush that uses augmented reality (AR) to make brushing teeth fun for kids. The device is paired with a motion-tracking app that uses your smartphone’s front-facing camera to put your child right in the middle of the fun. It comes with a phone stand, so your child don’t have to worry about holding up a phone while they brush. Check out the video. Magik will launch later this year for under $30. That is significantly more than your average toothbrush, but you get the brush, the mobile game, the stand, and a much happier child for that price.